Posted October 20, 2013, in Featured Student. Ryan Pachucki is a student who knows what he wants. 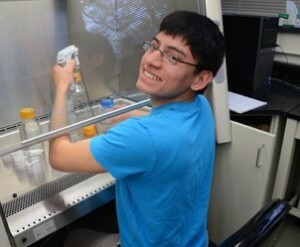 The biology major has always enjoyed science, and knew that research experience would be the key to his success. “The ability to do research at the undergraduate-level is the main reason I came to Rutgers-Camden [after earning an associate’s degree at Burlington County College],” he says. Over this past summer, Ryan, along with other students, worked in Dr. Kwangwon Lee’s lab, investigating the circadian rhythms of Neurospora. Page last updated by Department of Biology at 10:38 am December 13, 2013 . This page was printed from http://biology.camden.rutgers.edu/2013/10/20/ryan-pachucki/ at 6:18 AM Sunday, April 21, 2019.